When is Chamonix going to get fresh snow? This is the Snow Forecast and Weather Outlook for Chamonix, France from 25 April. The next notable snow forecast for Chamonix is 25cm10in, expected on 26 April, with around 52cm21in forecast over the next 7 days. There is significant snow currently indicated by the long-range (7 days+) forecast; but too far ahead to be relied upon. Powder Possible :- 24cm9in of Fresh Snow is forecast for Chamonix over the next 2 days. Chamonix is reporting "Spring Snow". Snow Line ranging from 2,130m6,988ft to resort level. Snow Line ranging from 1,744m5,722ft to resort level. Snow Line ranging from 1,825m5,988ft to resort level. Snow Line ranging from 2,529m8,297ft to 2,188m7,178ft, with rain below. Snow Line ranging from 2,896m9,501ft to 2,745m9,006ft, with rain below. Snow Line ranging from 2,194m7,198ft to 1,271m4,170ft, with rain below. Snow Line ranging from 2,194m7,198ft to resort level. Snow Line ranging from 1,732m5,682ft to 1,117m3,665ft, with rain below. Snow Line ranging from 2,040m6,693ft to 1,425m4,675ft, with rain below. Snow Line ranging from 2,502m8,209ft to resort level. Chamonix Snow Forecast built at 08:12, next update at 14:00. 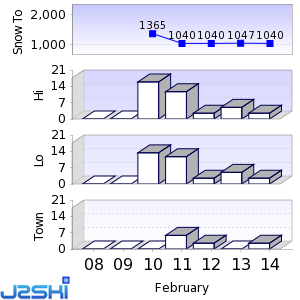 Snow and Weather Forecasts for other popular Ski Areas near Chamonix.